This year I started reading beauty blogs, and my interest in all things beauty exploded. 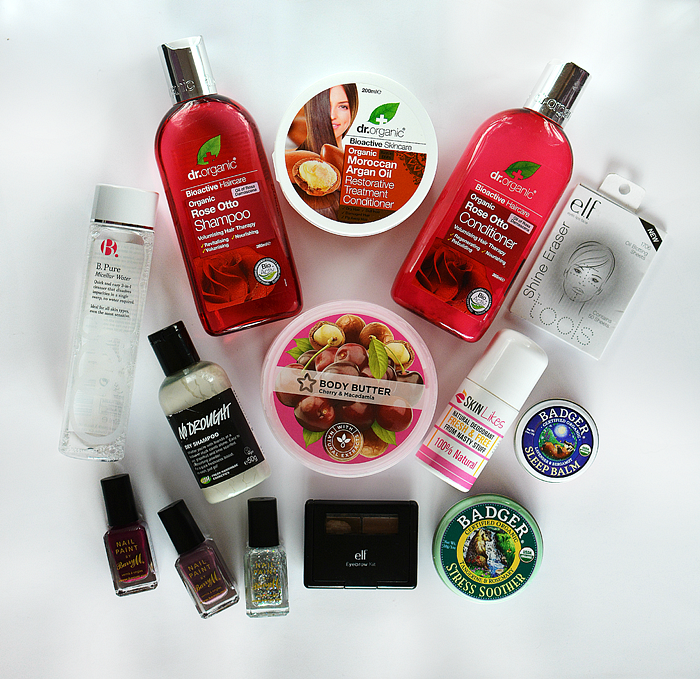 I absolutely love looking for new things to try and seeing my hair and skin benefit from looking after them. Here are my favourite products from this year, many of them new discoveries and now ones I wouldn't be without. Superdrug Cherry Body Butter - full review. This body butter smells good enough to eat and feels just as delicious. Dr Organic Moroccan Argan Oil Restorative Treatment Conditioner - full review. Using this treatment as a weekly hair mask has completely transformed my hair. Dr Organic Rose Otto Shampoo & Conditioner - full review. After switching to more natural hair products I'll never go back to SLS! A must have for oily skin, these absorb any shine from my face with no effort. Half wax, half powder this makes it super easy to create bold brows that last. Barry M Nail Polish - full review (one of my very first posts). The quality and staying power is unbeatable for the price. I want them all! B. Micellar Water - full review. The lazy girl's cleanser that takes off the dirt and grime of the day in one sweep. Badger Balms - full review. These natural balms smell good, feel good and do good. Citrusy scented, this leaves my locks looking and feeling clean and fresh. Skinlikes Natural Deodorant - full review. A natural deodorant that works, doesn't sting and smells lovely too. What have been your favourite products of the past year?